Rediff.com » Getahead » Yes, they are moms! Yes, they wear bikinis! Yes, they are moms! Yes, they wear bikinis! Kim Kardashian, Chrissy Teigen...now Soha Ali and Kareena Kapoor are being targetted for inappropriate behaviour. It's not unusual for celebrities to be trolled on social media. From being shamed for what they wear, eat and post, social media activists are busy trying to find faults in everything you do. The latest victims are Soha Ali Khan and Kareena Kapoor Khan. When Soha posted fun, cute pictures of their family holiday in Maldives, trollers had found their new victim. 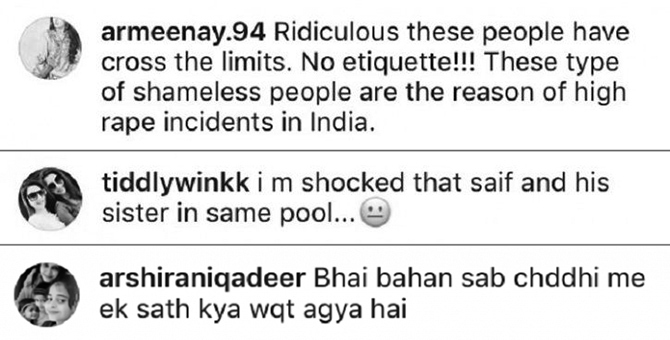 On Instagram, people pointed out how it was inappropriate of Soha and Kareena to wear bikinis in front of brother Saif and brother-in-law Kunal Khemmu. Soha didn't seem to mind the criticism and continued posting more cute pictures online. But it's not the first time celebrity mums were schooled on what appropriate behaviour is -- what to wear in public, how to treat their kids etc. Models Kim Kardashian, Chrissy Teigen and Liz Hurley have been soft targets too. Kim Kardashian was trolled for wearing a bikini to the beach when she was with her kids. Kim Kardashian was schooled for posting a picture of her daughter in a bikini. 'That swimsuit is a bit inappropriate for a little girl in my opinion,' a user wrote on her Instagram. 'You should not post pictures of your children on social media, you should protect them or at least keep them in child-appropriate clothing. Babies should not be in bikinis! It's sick,' another wrote. If you thought it's just bikinis that people are annoyed about, please scroll down. Model turned author Chrissy Teigen was shamed for posting a picture of her breastfeeding her son while her elder daughter Luna was around. The 33-yr-old who is #motherhoodgoals was called a 'narcissist' (the tweet has been deleted). 'I think it's perfectly fine for women who breast feed in public. They are doing it because they need to. When you post on social media that you are doing it, it comes across as narcissistic though,' the Twitter user had written. Like we said, no matter what you do, trollers will come after you. That shouldn't change who you are, what you do. Yes, they are moms! Yes they wear bikinis! Yes, they exist!